Tours of Egypt including Cairo, The Pyramids, Aswan, Luxor, Abu Simbel, the Nile, Giza, Sinai and the Western Desert. Tours from Israel to Egypt: Tours from Tel Aviv, Jerusalem, Eilat to Cairo. sees nothing, hears nothing. Yet through the silence something throbs, and gleams . . .
All our Egypt tours can start from Cairo, Sinai, Israel and Jordan. Tours to the Egypt doesn't incl border tax of $68 p.p. visa to Egypt- $42 p.p. and tips. or tour to Cairo and Egypt from Jerusalem This two day tour from Eilat to Cairo, covers many of Cairo's famous sights including the Pyramids, Sphinx, the renowned Cairo Museum and the colorful Khan el Khalili Bazaar. It takes in the impressive Mohammad Ali Mosque and Cairo's fascinating Coptic churches. Price per person: 2 people $450 per person, 3 people $390, 4 people $370, 5+ people $350 p.p. Additional expenses: A full Egyptian visa- 30$, Israel - Egypt border taxes 48$, Private drinks, lunch and tips, 5* supplement- 30$ p.p. IN ORDER TO SHORTEN THIS TIME AND WE NOW OFFER OUR CUSTOMERS THE OPTION OF FLYING FROM SHARM EL SHEIK TO CAIRO AND BACK. THIS WILL SHORTEN YOUR TRAVEL TIME BY 50% AT LEAST AND THE FIRST NIGHT WILL BE IN A HOTEL IN CAIRO INSTEAD OF IN OUR VAN ON THE WAY TO CAIRO. THE COST OF THIS ADDITION – 190$ PER PERSON (RETURN FLIGHT + THE HOTEL ADDITION). Day one– Starting early at Taba we head south and follow the coastal road until reaching the Bedouin Village of Nuweiba. Here we either enjoy the Arabian bazaar or take in the serene Red Sea views from the local beach. Continuing on to the sandstone area we stop at the ‘Rock of Inscriptions’. Some of the historical inscriptions on this rock date back up to 2000 years. From here we head straight to the towering red granite mountains of the high range where both St. Catherine’s monastery and Mt. Sinai are found. We enjoy our evening meal and settle for the night at Morgenland or Plaza hotel. Day four - Following breakfast we spend the whole morning the huge Cairo Museum, here we find the treasures of Tutankhamun and other Ancient Egyptian nobility (supplement for museum Mummy Room:$12). After lunch we visit all the major cultural sights of ancient Cairo, including the Mohamed Ali Mosque, Coptic churches and a brief encounter with the notorious ’city of the dead’ commencing our return journey to Eilat, arriving at approx. 22.00. Price: 2 people- $1690 in total, 4 people- $690 p.p., 5 people or more- $650 p.p. Included: Guide, transportation, HB in 4* hotel 3 nights in St. Catherine and Cairo, entrance fees (except Mummy chamber, and the library in St. Catherine’s monastery), lunch. Additional expenses: A full Egyptian visa, Border Taxes, Private drinks, and tips. Optional: Authentic Felucca cruise 15$ per person – highly recommended. Local Egyptian dinner in one of Cairo’s good restaurants 12$ per person only. Library in St. Catherine- $5 p.p. Participants in this tour may arrive directly at Cairo international airport or from Israel or Jordan by flight from Tel Aviv or overland from Eilat, Petra or Aqaba via Sinai. We arrange all transportation and travel logistics. Day 1- Arriving overland from Israel or directly into Cairo international airport. Transportation to hotel, settling in - briefing and evening meal. Day 2 – Beginning our Egypt tour in classic style we explore the very symbols of Egypt. The Pyramids of Giza and the famous Sphinx. Here we begin our adventure into the heart of Egypt, it’s wondrous views and attractions and uncover its mysterious past. We visit ancient Memphis and explore the tombs of its nobility at the Saqqara necropolis. This is also the site of the famous Step Pyramid. Day 3- We begin today exploring the the treasures of the world-renowned Egyptian museum. Here we can see many of the priceless treasures retrieved from the Pharaohs tombs, including the treasures of Tutankhamun. This is a day which encompasses the stark contrasts of Cairo life, we venture into the old city and explore it’s many sights of cultural interest including the Coptic churches and the Mohamed Ali mosque. We take some leisure time and experience the many sights and sounds of the Khan el Halili bizarre before returning to our hotel to relax and evening meal. Day 4- We begin today on morning flight from Cairo to Luxor (Aswan if doing the itinerary in reverse order) from the airport we go directly to our Nile cruise boat (Faluccas are available upon request). Today we first visit Luxor (Thebes) capital of ancient Egypt , here we find the spectacular temple complex dedicated to the God triad - Amun, Mut and Chons. We see the remains of the avenue of sphinx’s which originally connect the temple of Luxor to the temple of Karnak and we don’t leave Luxor without fist visiting the ruins of Karnak. Here the temple complex is overwhelmingly huge in all dimensions. It’s the second most popular site in Egypt after the pyramids of Giza. The utter vastness and its enormous structures, make it unique in the ancient world. We explore the Precinct of Amon-Re, by far the largest of all Egypt's temple halls. Day 5- On the opposite banks of the Nile we visit the Valley of the Kings where Egypt's Pharaohs and royalty were entombed, we explore at least one of the major tombs that are open to the public (various tombs are opened at the discretion of the authorities, depending on ongoing excavations) We also visit the Valley of the Queens where the pharaoh’s wives and close relations were entombed in decorative burial chambers. Day 7- A relaxing cruise takes us to Kom Umbo where we stop to visit the temple. The temple here is dedicated to the crocodiles of the Nile whom the early Egyptians believed brought the water of the Nile. There is a mummified crocodile and an ancient measure for measuring the water level. We continue along the Nile to Upper Egypt and Aswan. Day 8- Aswan offers a host of attractions and we take is as many as time will allow including the Island of Elephantine (ancient fortress and center for ivory trade) and the Island Philae (and its temple complex), the famous ‘Unfinished Obelisk’ and the high damn. Here we leave our Nile cruise boat and begin our return journey at the Aswan airport. Abu Simbel - The Temples of Ramses and Nefertari are a short flight south (bus optional) of Aswan in Abu Simbel, perhaps the most prominent of Egypt's Shrines they are unique in both their location and their architecture. Accommodation is in good hotels but up-grades available upon request. Tours based on domestic flights but trains can be used -We can opt for the train from Cairo to Luxor ( hours) or to Aswan (12 hours) the train is equipped with bunks so we can sleep en route, breakfast and dinner are provided. The tour includes guides, transportation (incl. Transfers, cruise, train, flights – where applicable) all meals, entrance fees to all sites. Not including personal expenses, drinks, tips and border taxes. From the endless expanses of the Western Desert. 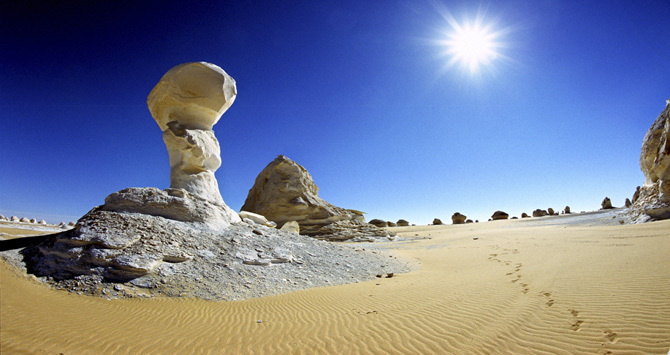 The mesmerizing scenery of the White Desert. The ancient desert oasis towns of Baharia, Farafra, Dakhla and Kharga. The hustle and bustle of Cairo. The shores of the Nile. The magnificent Temples of Luxor and Karnak. Edfu and the temple of Horus (Falcon God), the Kom Umbo crocodile Temple. The island temples of Aswan and the very Temple of Ramses himself at the remote Abu Simbel. This tour covers all aspects of Egyptian life both urban and remote. Ancient and modern. From the Sahara sands to Cairo, this is the complete Egypt experience. Tour itineraries are based on years of experience exploring the natural wonders as well as the man-made ones. Tour itineraries can be customized according to clients preferences. There are several variations on this tour. Some people prefer the overnight train from Cairo to Luxor with sleeping compartments, others to fly directly to Abu Simbel. Once on the Nile sightseeing between Luxor and Aswan (including Valley of Kings, Edfu, Kom Umbo) can be done on an old fashioned Egyptian Falucca or on a cruise boat with more comfortable facilities. Accommodation is modest or modern depending on preferences and location. Tours include all accommodation, guides, drivers, transportation: trains, flights, 4x4s, busses, Nile cruise - Falucca or boat, horse drawn carriages (Edfu). All accommodation and meals, entrance fees. Not Including: Tips, border taxes, private drinks and personal expenses.